1. There's incredible world-building. If there's one thing I enjoy about any fantasy novel, it's the presence of a cleverly built world. 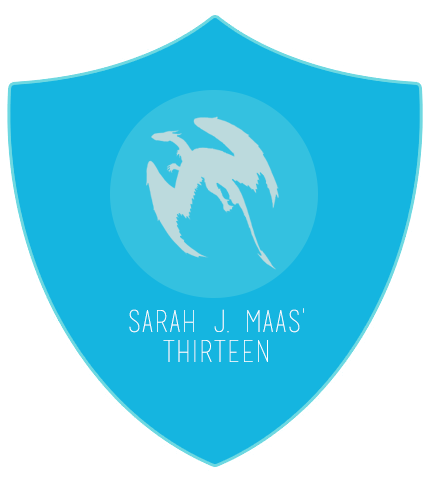 Despite initially feeling like the novel was building up slowly, I realized that it definitely helped me to fall completely head over heels in love with the kingdoms and the characters. 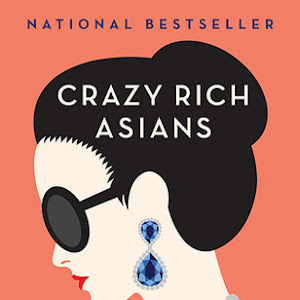 The descriptions are so vibrant and detailed that I really felt like I was wholly immersed in this world. 2. There's character complexity - especially when it comes to Alera, our main character. The entire series revolves around Alera, a Crown Princess of Hytanica. Her personality is completely appealing, as it's a combination of an intelligent mind, a loving heart and a brave spirit. The transformation that she undergoes from being a mere girl to a woman to the Queen of Hytanica is pretty much brilliant and entirely realistic. It's her strengths and weaknesses that make her who she is, and I adore that her growth and maturity feel organic. 3. There's action and intrigue and secrets and betrayal and transformations.As a fantasy novel, there's always a lot going on. And I'm all about the action! Despite the fact that there's a lot of detailed descriptions, I felt like there was a lot of action too - what with all the secrets, the fight scenes, the sweet moments, the introduction of new friends and new foes. 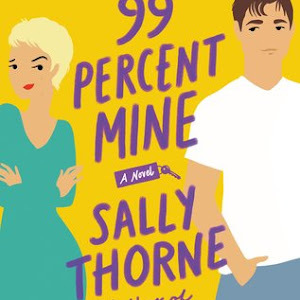 These books certainly packed a punch, and I enjoyed going up and down and all around with these characters as they faced situation after situations. 4. I started out rooting for Narian and hating Steldor in book one; by book two, I was wary of Narian and rooting for Steldor. It is rare that I can truly appreciate the way a love triangle is done, and this is definitely one of those cases. I started out like Narian (of course!) because he's such a mysterious, intriguing person in the first book, and I adored the moments he shared with Alera. But by the end of book two, I was firmly and surely in the Steldor camp. He may have started out as such an aggravating character in the first book, but we really got to see another side of him in the second, and I just completely fell in love. 5. 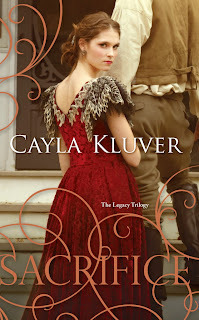 Cayla Kluver has inspired me to want to start writing again. Her writing is fluid and beautiful, and even though the books are incredibly long, I never felt bored or bothered while I read. She pays very close attention to detail, and also develops the characters into fully-fleshed people. I also think her story, of how she got published at SIXTEEN, is just amazing. Plus, she's incredibly nice on Twitter. I hope I get to meet her one day! This is not the time for the fight to end. Now is when the fight will begin. This is the time to regain what has been lost. One ruled Hytanica, but now walks the razor's edge to keep the fragile peace in her beloved homeland. The other slips through war-torn streets, seeking retribution for her family's tragedy, following whispers of insurgency. Both face choices that will separate them from those they cannot help but love. As their stories intertwine, a conspiracy ignites that may end in slavery or death - or lead to freedom anew, if only each can face what must be sacrificed. 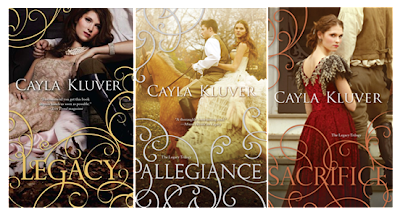 With the book industry currently in a debate over print vs. digital, Cayla Kluver, born October 2, 1992 in Wisconsin, truly embodies the next generation of author. At just 19 years-old, Cayla has already published her debut novel Legacy in three different formats. 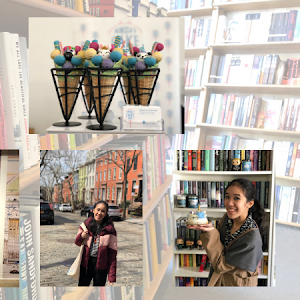 It all began with self-publication and the creation of her own publishing house (with the help of her mom, called: Forsooth Publishing) in 2008. Cayla was then offered a digital debut with Amazon (was the premier title for Amazon’s self-publishing program, Amazon Encore) in 2009. 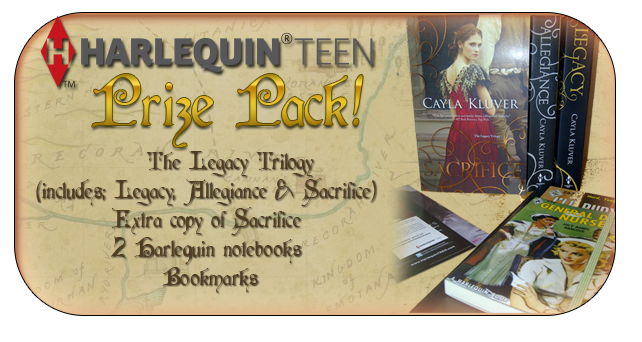 Finally in 2010, Cayla was signed to a three book publishing deal with Harlequin TEEN. She has cats, dogs and horses, and watches more crime shows than is probably healthy. Her office is filled with twinkly lights, candles and fun colors. She loves Robert Louis Stevenson and the Beatles. You can follow her on Twitter, find her on Goodreads, visit her website, as well as join her fan page on Facebook. 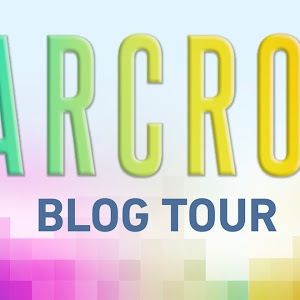 There are two giveaways on this blog. Both are only open to US/CN readers. 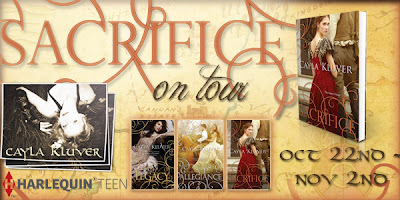 Giveaway #1 is 1 copy of Sacrifice, and is open to all the readers of my blog. Giveaway #2 is going to be chosen from all entries during the tour. 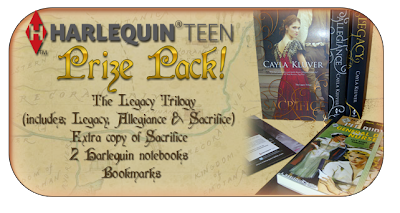 The prize is a HarlequinTEEN Prize Pack that includes 1 copy of Legacy, 1 copy of Allegiance, 2 copies of Sacrifice, bookmarks and Harlequin notebooks. 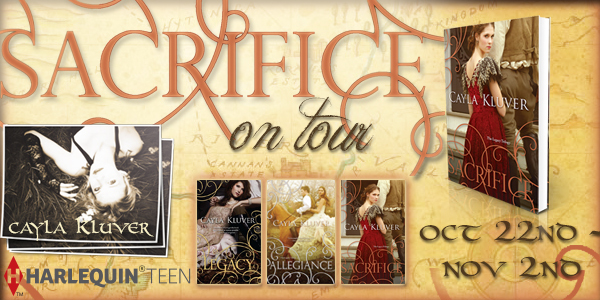 You can also visit the Sacrifice Tour Page for more information! I'm so excited to read this last book in the series! Such pretty covers! And they sound AMAZING! Am definitely entering, but will have to pick them up regardless! I really like the idea of this whole series. Something different for me for sure!! Thanks for the great post! Very excited to finish this beautiful series! Hope the tour goes well! I remember first reading your thoughts on these books! In fact, it pushed me to go out and add the series to my already gigantic TBR pile! They sound so incredibly interesting and it sounds like something I am going to just ADORE! Also, your list (you know I am a fan of lists!) made me even more excited to start this series! EXCITING! ECSTATIC! HAPPY! THRILLED! CAN'T WAIT!!! I'm JUST hearing about this series! It sounds great -- and I love the covers! Oh, and I love a series where my thoughts about the characters change as the series goes on.